I HATE, HATE, HATE Japanese Beetles!!! Can I say it again, I HATE JAPANESE BEETLES!!! They destroy everything in their path but they love roses. NASTY LITTLE CRITTERS!!! Okay, I feel better. 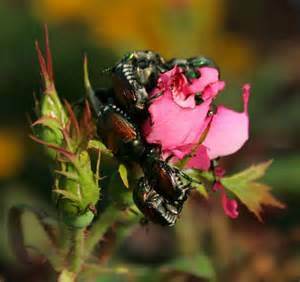 Japanese beetles grow underground where you can’t see them and hatch in late spring, early summer when my roses start to bud and bloom. They fly, crawl and have a hard shell which makes them difficult to kill. They get inside the rose buds or underneath the rose leaves and eat my roses from the inside out. I can check my roses in the morning and they will look fine but, when I go out to look at them later the same day they have holes straight through the heart of them. When I first moved to Maryland and started caring for my roses I didn’t know what Japanese beetles were because I didn’t have to deal with them in California or Texas. I was talking to a friend one day and telling him about this bug that was eating my roses and nothing I used got rid of them. He identified the pest and told me to get some Sevin and that would do the trick. That afternoon I went to a nursery and picked some up. My friend was correct. As soon as I started spraying my roses with Sevin the beetles began to fly away and die. Now that I’ve lived in Maryland for over 20 years I know how to deal with the beetles. As soon as the humidity starts, I begin two-a-day spraying; once in the morning and again in the evening. The humidity seems to be the trigger for the beetles to come out and destroy. We have things that are eating us from the inside out. Things like hate, envy, jealousy, pride, low self-esteem and feeling less than are just a few things that eat at our spirit persons. There is also the spirit of control, you have to control everything and everyone or everything is wrong. Then there’s a competitive spirit, you have to win and be first in everything even when no one else knows there’s a completion underway. The list of things eating us from the inside out goes on and on but there are three solutions; The Word of God, prayer and professional help. We need to identify the triggers that cause our internal bugs to start their eating frenzy within us. We need to pay attention to our feeling and emotions when this happens, also called self-awareness and we need to spray our internal bugs with the God’s word and prayer. If necessary, we need to seek professional help to deal with our internal bugs. It’s okay! The goal is to kill that which is destroying you from the inside out.